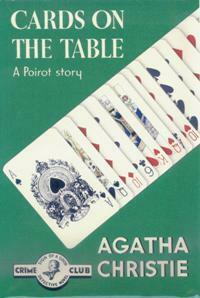 Cards on the Table is a work of detective fiction by Agatha Christie and first published in the UK by the Collins Crime Club on November 2 1936 and in the US by Dodd, Mead and Company the following year. The UK edition retailed at seven shillings and sixpence (7/6) and the US edition at $2.00. The book features the recurring characters of Hercule Poirot, Colonel Race, Superintendent Battle and the bumbling crime writer Ariadne Oliver, making her first appearance in a Christie novel (she previously had a role in the Parker Pyne short story The Case of the Discontented Soldier).